BETWEEN 1999 and 2011 São Paulo’s murder rate fell by almost three-quarters, turning what had been one of Brazil’s most dangerous states into one of its safest. Now the violence is rising again. In the past two months more than 300 people have died in the state capital in an undeclared war between police and the Primeiro Comando da Capital (PCC), a drugs gang, twice the tally for the same period last year. More than 90 police officers have been slain since January; the total for 2011 was 56. This year looks certain to close with the state murder rate back at over ten per 100,000 residents: epidemic level. At first the state government claimed the rise in killings was a blip. It refused to mention the PCC, apparently for fear of glamorising it or causing panic. That made it look complacent. 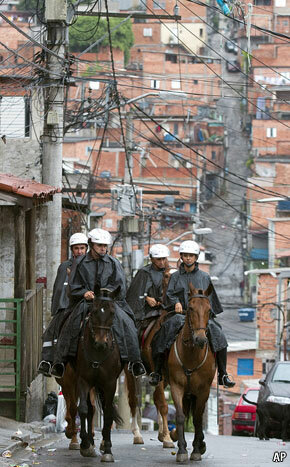 In October the federal justice minister said he had offered São Paulo reinforcements, but been refused. They were not needed, huffed Antonio Ferreira Pinto, the state’s prickly security secretary. His federal counterpart, Regina Miki, suggested that São Paulo should learn from Rio de Janeiro, which uses federal forces to expel gangsters from its lawless favelas (though Rio’s murder rate remains double São Paulo’s).